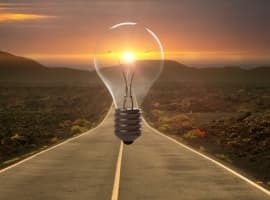 Considerable improvements in battery technologies and technological advances in manned electric flight have spurred established automakers to begin examining the feasibility of flying automobiles, as both Audi and Porsche have mentioned their plans to develop flying cars to avoid congested highways. 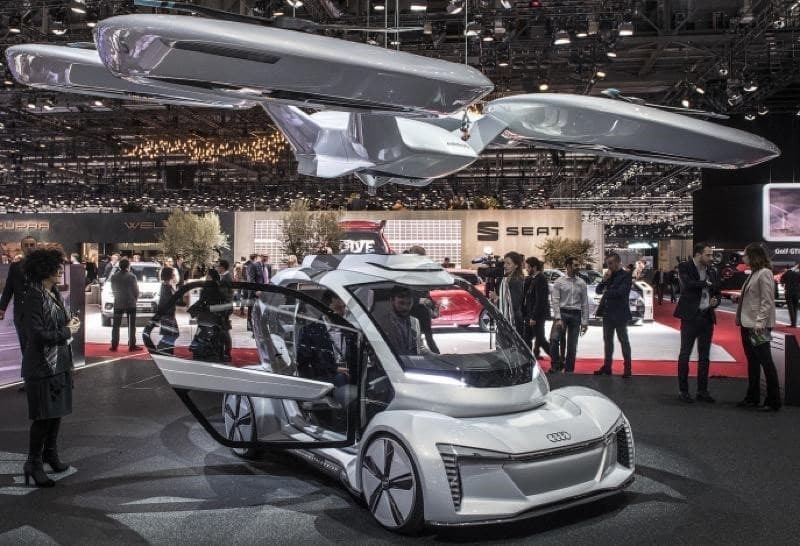 During the 87th Geneva International Motor Show, Audi and Airbus partnered with Italdesign to premiere Pop.Up Next, the first modular, fully electric, zero-emission concept vehicle system designed to alleviate traffic congestion in large populated areas. Pop.Up Next is a modular system for multi-modal transportation that can travel on roadways and across the skies. 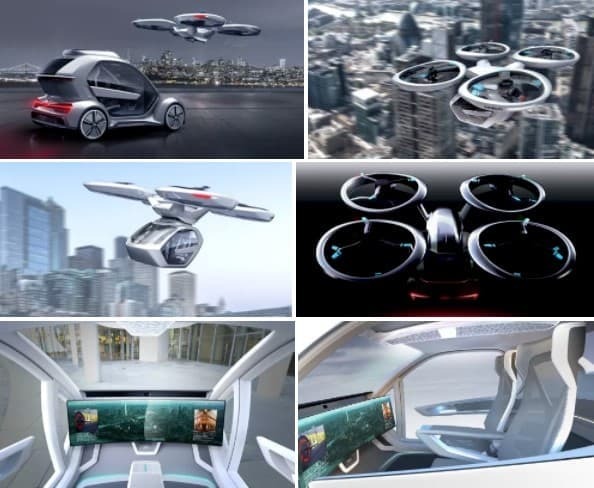 Audi, Airbus, and Italdesign developed the unmanned drone system that attaches itself to an electric vehicle – turning it into a flying passenger aircraft, as a joint reflection on how to address mobility challenges of large cities. With traffic congestion projected to hugely increase by 2030, the companies decided to combine their engineering expertise to tackle how to best achieve a sustainable, modular and multimodal urban mobility system – giving rise to the Pop.Up concept. • An interface module that dialogues with users in an entirely virtual environment. 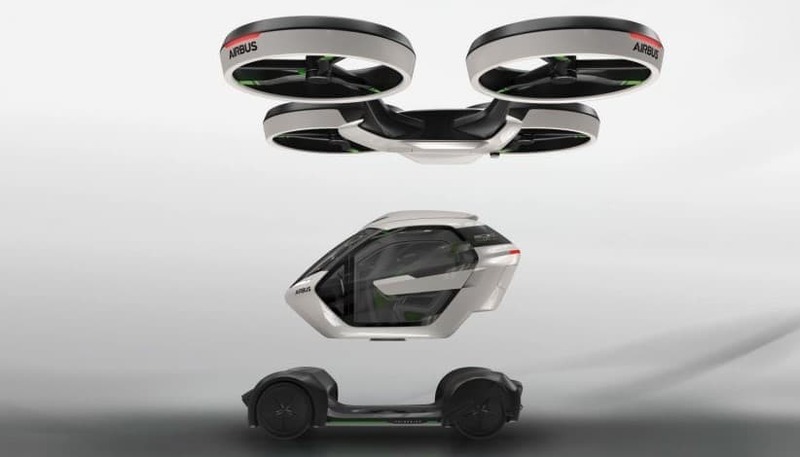 The vehicle is a two-seat pod that can quickly snap into a chassis with four wheels and autonomous driving technology for roadway travel, or easily converts to a quadcopter drone for flying. While Audi has yet to release details on speed, altitude or range, the overall progress of flying cars seems to be a reality in the not too distant future. “Pop.Up Next is an ambitious vision that could permanently change our urban life in the future,” his statement added. Pop.Up Next reflects the philosophy driving Italdesign’s 50th anniversary celebrations, anticipating the challenges that the next fifty years will bring. 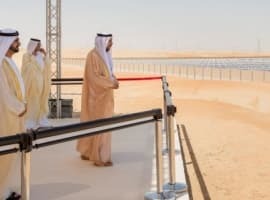 It represents a vision of the potential offered by future technologies, the new concept of transportation and the new solutions for resolving the problems linked to city planning and traffic in large urban centres that are increasingly becoming one of the priority aspects for safeguarding our planet. Next is evidence of the success achieved by Pop.Up over the past year amongst the main players in the transportation world, the municipalities and institutions worldwide. Earlier this week, Porsche R&D chief Michael Steiner told Reuters at the Geneva show that his team of researchers are in the process of developing flying taxis for urban use. Interesting to note, Audi and Porsche, are both owned by the Volkswagen Group, which it seems, the European automobile manufacturer is pushing their brands into the flying car space. Meanwhile, in the United States, Boeing and Uber are developing a flying taxi which could be zipping around the skies of America within the next ten years. That is according to Boeing CEO Dennis Muilenberg, who said, “it [flying taxis] will happen faster than any of us understand,”in a Bloomberg interview. 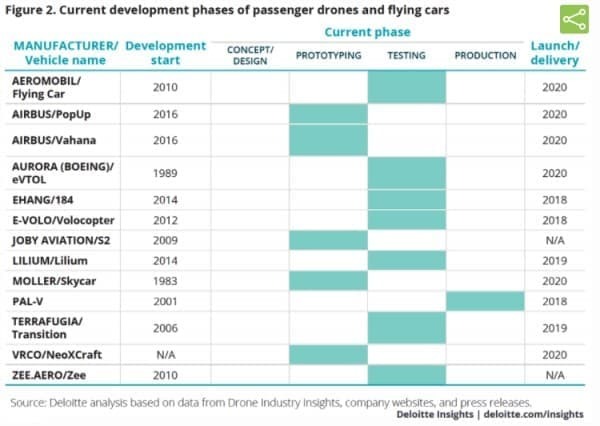 According to the latest research by Deloitte, more than a dozen drone and flying automobile manufacturers have already passed conceptualization/design phase, and a majority of the manufacturers are currently exiting the prototype stage into the testing phase, with most manufactures targeting launch/delivery by 2020. “If safety and regulatory hurdles are cleared, passenger drones are expected to get wings by 2018–2020, and traditional flying cars by 2020–2022, while revolutionary vehicles could be a reality only by 2025,” Deloitte reported. These ever increasing articles on flying cars and taxis in urban areas are written by people that have no flying experience or understanding of the hazards that will prohibit this sort of thing. Regardless of whether you are the head of Boeing or head of design at German car companies if you have never tried to land aircraft in strong winds or experienced all types of weather in year round flying operations, or flown in congested flying zones, you are not competent to appreciate why large numbers of so called flying vehicles will not fill city skies. Weather in all it's changing conditions from rain to low cloud, fog, snow etc are serious barriers let alone traffic control and segregation. 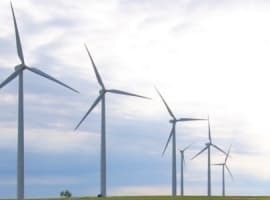 The problem of engine failures at low level over cities and strong winds between and around city buildings, power lines, communication towers, radio or communication failures and other emergencies associated with flight are all serious reasons why Aviation Authorities will never allow this to occur. Another party that would have a defining say in this whole area would be the Insurance Underwriters. There have been a number of instances in recent years with airline aircraft departing from normal flight attitudes because of auto pilot malfunction and once you introduce thunderstorm activity and severe weather and the inability of inexperienced operators to assess all these hazards it is hard to see aviation authorities in any country allowing this. A few deaths would quickly have all running for cover. Aviation with all it's congestion now, doesn't need this sort of madness inflicted upon it. I write this with 53 years in aviation and a long airline career. rk has got it exactly right. These are pipe dreams of people who have no understanding of the difference between navigating in three dimensions (flying) vs. navigating in essentially two dimensions (cars). The complexities and problems are an order of magnitude higher. People are having fun fantasizing about it, but it ain't a real thing, other than possibly as a novelty toy for the rich. Listen here, we all have a right to dream about flying. I just saw Hook the movie. Peter Pan was flying all over the place. We want to fly! How many people got killed by big stone wheels back in the day? Parachutes killing people? Trapeze artists killed? Tight rope walkers? Rocket ships to space like the Challenger? Cars and buses with people? Millions killed but millions keep on trying. Keep on progressing. Always observe the precautionary unspoken rules before challenging gravity. We are humans with smartand stubborn brains! We must move forward! And upward of course! Even in dreams, we must find balance. As a pilot with over for over 40 years experience, I agree that the risks laid out by RK are real. It's not as simple as Peter Pan makes it look, but it's not rocket science either. For today's pilot, understanding the risks involved (any of which can ensure that today's flight is your last, ever) and maintaining skills to manage those risks requires a continuous investment in education that most flying car commuters would not take be willing to make. If we leave that aside and consider RK's examples, flying anything between skyscrapers in windy conditions is a recipe for disaster. The risk grows exponentially if you factor in congestion that would result if even 5 percent of downtown drivers took to the air. Unlike tight rope walkers, mountain climbers, and trapeze artists, when flying cars fall the fatal impact isn't limited to the risk-taker. The crash of flying car into a congested area on the way home from a day at the office not only risks death for the occupants and destruction of the vehicle, it also spreads the fatality risk to multiple persons on the ground and the risk of destruction to buildings and property. The point isn't to rule out risk, but that it must be understood and mitigated as we move forward. I'm intimately familiar with the powerful urge to fly that Art expressed above. Not everyone feels the same urge, but many of us do. That urge creates a constant force that will cause us to keep expanding the boundaries and finding ways for more people to take to the air. Moving forward, precise 3D mapping and advances in autonomous vehicle technology will reduce the importance of individual piloting skills. Regulations will specify required traffic patterns or approved highways-in-the-sky for airborne commuters which in turn will require automation, taking the "driver" out of the loop. There will be limitations on where and perhaps when your commute can be conducted and special facilities will need to be created for air commuters (even the best air-car can't land on the second floor of a downtown parking structure). Delivery drones and air-taxis will help us evolve. They will be the air pioneers that will cause us, as a society decide what's acceptable. •	Is it OK for the Amazon drone to come screaming over our house at 2am? … at 10pm? •	What about the cloud of dust, debris and trash can lids that blankets the whole block each time an air taxi drops your neighbor off in your condo complex? •	How much automation will be required - is every driver allowed to "fly all over the place" like Peter Pan or do they simply enter a destination an let their vehicle do the rest? Lot's of questions. That doesn't mean that there are no answers... it simply means that if we hope to reach the dream of air transportation for everyone, we have a lot of work to do. To get there, we may need to tailor the dream so that it integrates smoothly with the world we live in. Aud to multiple persons on the ground and the risk of destruction to buildings and property. The point isn't to rule out risk, but that it must be understood and mitigated as we move forward. - Is it OK for the Amazon drone to come screaming over our house at 2am? - What about the cloud of dust, debris and trash can lids that blankets the whole block each time an air taxi drops your neighbor off in your condo complex? - How much automation will be required - is every driver allowed to "fly all over the place" like Peter Pan or do they simply enter a destination an let their vehicle do the rest? Lot's of questions. That doesn't mean that there are no answers... it simply means that we have a lot of work to do if we hope to reach the dream of air transportation for everyone. To get there we may need to tailor the dream so that it integrates smoothly with the world we live in. Audi, Airbus, Porsche, Boeing, Uber and others not mentioned in the article are just beginning the work.... and it is exciting! Lot's of questions. That doesn't mean that there are no answers... it simply means that if we hope to reach the dream of air transportation for everyone, we have a lot of work to do. To get there, we may need to tailor the dream so that it integrates smoothly with the world we live in. Audi, Airbus, Porsche, Boeing, Uber and others not mentioned in the article are just beginning the work.... and it is exciting!